Following a busy, social weekend with big meals and late evenings, Sunday is nicely relaxed and peaceful with no reservations, no make-up and no agenda. Dinner will reflect simplicity and balance with fresh and light ingredients and minimal fuss. It’s a perfect moment for this restorative chicken soup, using leftover meat and homemade stock from last week’s roast. Carrots, shiitakes, and fresh snipped parsley from our terrace pots brighten and flavor the soup, while farro adds a little nutritional heft to this easy one-dish meal. Heat oil in a soup pot or Dutch oven over medium heat. Add onion and sauté until it softens without coloring, 2 minutes. Add carrots and mushrooms. Sauté until carrots brighten in color and mushrooms begin to release their juices, 2 to 3 minutes. Add stock, farro, bay leaf, thyme, salt and pepper. Bring to a boil, then reduce heat. Cover and simmer until farro is tender, about 25 minutes. Stir in chicken and top off with additional stock if needed. Taste for seasoning. Simmer until chicken is heated through. Ladle into bowls. Serve hot, garnished with parsley. I love a good soup on Sunday. There’s just something so nice about winding down a busy weekend with the slow, methodical preparation of making a soup. It’s especially nice when you can enjoy it throughout the week, too! This looks so delicious, Lynda. Thanks for sharing! I have all the ingredients for this soup on hand. Looks delicious! A delightful spring-like soup. Light and flavorful. Farro is such a delicious grain….lovely! Your soups are always so fresh looking! Pretty as a picture that soup! Fresh and beautiful, simple, love it. I have a chicken roasting right now, and we will have lots of leftovers. Lovely looking soup! 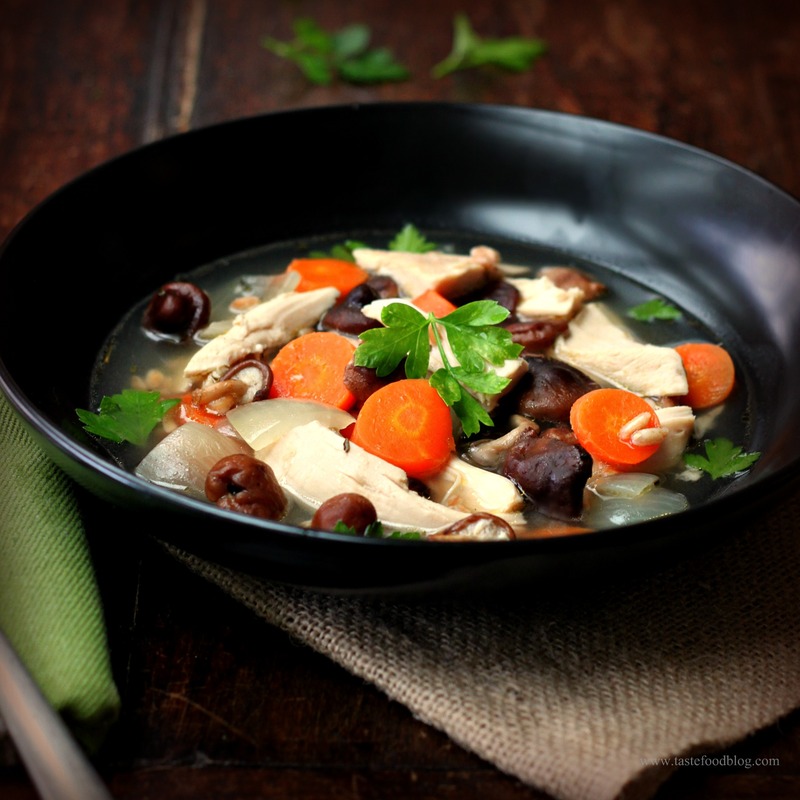 A lovely soup that looks light and comforting. I like the addition of farro- great idea! Your recipes sound wonderful, but I never use a recipe that doesn’t include nutritional facts. Is there a reason your recipes do not include these facts? Thank you for your comment. I am good at creating recipes, but less quick at programming a website. Nutritional facts are high on my to-do list – once I figure out how to do it.